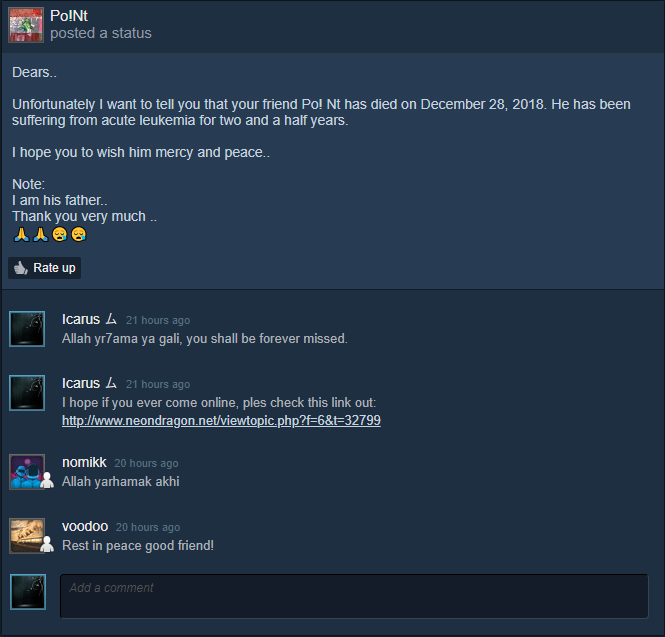 After the recent departure of our dearly beloved point, a message was posted to the steam activity feed by apparently his father, I hope some of you can check it out as it has information as to the disease he had and some support in this hard time. Reading the cause of death brought back memories that I wish I wouldve forgotten. I truly hope you're in a better place Point, I'm sorry your last years here were pain that can't be put to words, but I pray you managed to find happiness out of some moments during the way. You and your family will be in my prayers. This one did hit me so hard, I couldn't believe what I read. I read it when I was in hospital and it took me some days to get rid of a deep sadness. Point, wherever you are my beloved friend, I hope you will only see and feel good now. Free from all that pain and stress you had to suffer about. You will be never forgotten by me!!! One of my first close friends I met in nD, even when i write now it makes me so damn crazy sad again and I simply ask myself "Why, just why?"